The best option is to use the Motion vector G-buffer in 3dsMax. Using the G-buffer fusion in is simple. In the Loader chose the G-buffer channels for the X and Y velocity. 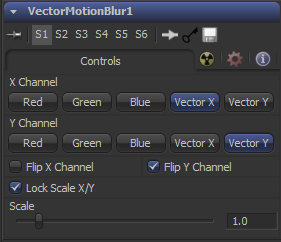 Then flip the Y channel in the VectorMotionBlur tool to point the vectors in the correct direction. The Toxik blur tool is actually very cool. The fact that DOF and motion blur are packaged together in one tool is a real advantage over Eyeon Fusion. VideoTip #18 – How to use a Motion Vector pass from MAX’s Scanline renderer! There’s also a longer in depth look at motion vectors and some fixes if the tools don’t quite behave as they should do. VideoTip#21 – In-depth view of Motion Vectors from MAX to Composite!